Super Hero Boy: A toddler's birthday party = a super huge mess. A toddler's birthday party = a super huge mess. The party is looming closer and closer.. and we are dreadfully behind. Connor's second year molars are coming through and needless to say we have been struggling with night terrors and fevers and even a trip to the ER. In way to short of a time I will have a large group of children at my house not to mention tons of family members and knowing my mother she would be horrified if the grass was not perfectly mowed lets not even talk about the dust that I haven't cleaned off the furniture in months. Cleaning makes me sick, I'm not even kidding, between the dust and traditional cleaning products with all those harsh smells combined with my allergies the whole ordeal past just simply wiping down the counters with mild soapy water is frustratingly terrible for me. I almost hate to admit this but though I've always been aware of my own responsibility for this earth and I would love to say that's the reason we use so many green friendly products in this house, that's only partially the reason. Honestly enough Seventh Generation's cleaning products were one of the big changing factors in our green attempt in this household. Though I've been familiar with Seventh Generation for some time the review we did for them awhile back really changed my entire perspective. Before using Seventh Generation I'd consider this house as a casual green user (meaning we would make small changes and product choices only when it really benefited us either financially.. like using wash rags instead of paper towels.. or the fact that I really just like the organic or green products better such as bamboo). 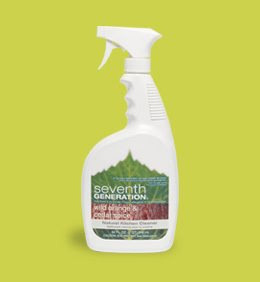 Coming from a family where its a fact of nature that if your not using a harsh cleaning product it must not be clean, imagine my surprise at my first experience with Seventh Generation. Not only have I not missed my icky lung burning chemicals but for once I can clean without having to spend the rest of the day in bed. So basically Seventh Generation was a spring board to every other green change we have had in the last year. So needless to say I was thrilled when we got a gift pack of Seventh Generation products to clean up after the herd of insane children that are raving our house for Connor's party. Recycled paper towels to clean up all the spills, all purpose cleaner to clean up after making my famous dyed rice crispy treats, and window cleaner to clean up all the little nose and finger prints on the glass door. Plus a host of others to help me clean up before my guests arrive. The one Seventh Generation product that I can't seem to live without is my Seventh Generation Kitchen Cleaner in Orange and Ceder Spice. It smells amazing and I can use it all day without feeling wuzzy. In a house with a toddler in diapers, 8 week old puppies, six other dogs, and my terrible cooking skills we tend to use cleaning spray quite often. The problem is all to often the messes I'm cleaning up are quite smelly and most cleaners just don't do the job and lets not even talk about how dangerous I am with a bottle of bleach so that's not an option. I've used our Seventh Generation Kitchen cleaner to not only clean up the grossest of puppy cages, diaper pails, and on the worst messes I can make in my kitchen. I've always found that it not only does the job, it leaves my kitchen smelling amazing. It also does as good of a job at getting stains off my counters as good if not better than any other product I've tried. I've also found it does an amazingly good job of getting that baked on grease off my smooth top range. I just spray it on and let it sit for a bit and more often than not the grease will wipe right up afterwards. Check out the entire selection of Seventh Generation products on their website! I have an awesome treat for you guys. Seventh Generation wants to give one of my readers their very own starter set of products. One winner will receive a Living Home Starter Kit which includes quite the selection of home cleaning products : glass cleaner, all purpose cleaner, kitchen cleaner, tub and tile, paper towels and more! Leave a comment on this post. Check out Seventh Generation and their awesome product selection. Then come here and tell us which product you love or would like to try and why!! Make sure you read below to earn extra entries including a scavenger hunt entry. Answer the I Spy trivia question "Check out Seventh Generation's website and take a look at the products! I spy something that will get that chocolate cake stain out of Connor's clothes without fear of messing up the color! Do not leave this entry in your comment all trivia question answers go to contestsatsevendogs@gmail.com. Use the subject "Seventh Generation" Posting "I spy" answers in comments will disqualify you! This contest will end May 15th at midnight! I would like to try the toilet bowl cleaner because I have a thing with toilets. I think they are yucky because they're so hard to keep clean! I did the I Spy trivia-this is fun. I'd like to try the Natural Glass and Surface Cleaner. I am addicted to the "blue glass cleaner" but I know with a three year old, I should use something more natural. Thank you for doing all the hard work of a give away and thanks to Seventh Generation for a generous prize! I want to try the natural all purpose cleaner. I am worried about my infant putting everything in her mouth and the chemicals on other cleaners. I would love to try their chlorine free baby wipes. Thanks for all these fantastic giveaway! I've been meaning to try their 100% Recycled Bathroom Tissue. Goodness knows I could use the cleaning products. Maybe I'd feel like spring cleaning then. I would like to try their all purpose cleaner. Thanks for the chance. I would love to try the Natural 2X Concentrate Laundry Liquid. I am looking for some great natural laundry detergent yet doesn't cost a whole lot and this would be perfect. Thank you so much! I love all purpose cleaners... something that cleans everywhere!! would love to try the toilet bowl cleaner because I can't seem to find a non-toxic one that works and I like! I would like to try the Natural Powdered Laundry. Great Giveaway! I found you listed on Sweepstakes Advantage. http://www.sweepsadvantage.com . Good Luck Everyone! I most want to try the Glass & Surface Cleaner. It's the type of product I use most and would love to see how this stacks up. I'd love to try the new dishwasher detergent packs! I would love to try the dryer sheets because they are compostable or recyclable. Sounds like a good idea to me. Your blog is on my Google Reader. I would definetly like to try the Toilet cleaner because we have 6 people in our house and 4 of them kids, so there's a lot of cleaning toilets going on! I'd love the Toilet Bowl Cleaner. I hate using harsh chemicals to get a white bowl. I'd love a "greener" alternative. I would also love to smell the Wild Orange and Cedar Spice Kitchen Cleaner. Sounds delish! I have yet to try the Emerald Cypress & Fir Toilet Bowl Cleaner. I really like their products. I would love to try the Chlorine Free Training Pants as we are getting ready to potty train! I would like to try the Color-safe bleach. Because it's Non-toxic and Hypo-allergenic. I'd like to try their diaper. Thanks! I love using the dishwasher but I hate knowing that the chemicals in my current diswasher pacs are probably so gross. I have blogged the party and Seventh Generation giveaway! I emailed my answer to the I Spy trivia question!